YOKOHAMA - Fans of conservative, defensive soccer would have done well to steer clear of Nissan Stadium on Saturday night. 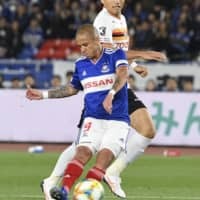 That left plenty of room for everyone else to enjoy the end-to-end action between two offensive-minded sides as Yokohama F. Marinos and Nagoya Grampus battled to a 1-1 draw in front of 22,667 fans. Marinos striker Keita Endo handed the visitors a gift-wrapped opportunity in the seventh minute with a clumsy hack at the edge of the penalty area that sent Nagoya defender Kazuya Miyahara flying. Referee Yudai immediately pointed to the spot, and Jo’s penalty kick sent goalkeeper Park Il-gyu the other way as the Nagoya field players rushed in to celebrate by the corner. It was the reigning top scorer’s first goal since Feb. 23, when he netted a pair to open the first-division season at Sagan Tosu. “We didn’t start well by giving up a penalty. When you’re playing good teams it’s important you don’t make decisions like that,” said Postecoglou. Ken Matsubara nearly equalized in the 11th minute when his left-footed curler struck the post. But it was Marcos Junior who pulled F. Marinos even in the 20th minute. The Brazilian slipped through the Grampus back line and was in perfect position to receive Teruhito Nakagawa’s low cross following a superb Koji Miyoshi’s through ball, unleashing a grounder that Nagoya goalkeeper Mitch Langerak could only watch from his knees as it tumbled into the net. In a troubling incident minutes later, Langerak spent several minutes down on the pitch after the back of his head was accidentally struck by Endo’s knee during another Marinos counter. The Socceroo netminder was eventually carried off on a stretcher and replaced by backup Yohei Takeda. “He has a concussion. I haven’t heard anything (from our medical staff) but it doesn’t sound like it was much more serious than that,” Grampus manager Yahiro Kazama said. Grampus mounted several promising attacks as it sought to retake the lead, but Park didn’t let any more past him as the first half ended deadlocked at 1-1. After a strong run on goal by Endo just after the hour mark that could only be stopped by Yutaka Yoshida’s professional foul, Marcos Junior’s free kick from a meter outside the box looped over the wall but went just wide of the post. A Park gaffe in the 76th minute nearly gave Grampus the lead when he failed to make a clearance in front of the goal, but at point-blank range the ball was improbably crossed low and into his hands. Just seconds later, F. Marinos responded with their own attack and Takeda made a fantastic leaping save to deny Marcos Junior’s rocket from near the top of the arc. With seven minutes left in regulation, Jo missed a chance to score his second of the day when his one-on-one shot was parried by Park for a corner kick. “When you need the big saves you need to maintain your concentration. 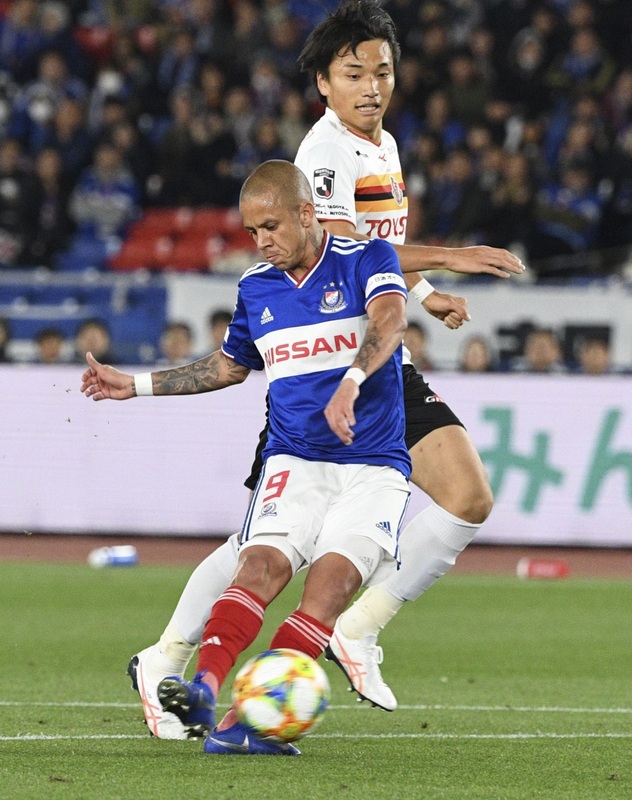 In these three games Park has shown very good concentration when the moment comes,” Postecoglou said of the 29-year-old, the oldest F. Marinos player on the pitch. Jo had one more chance in the 90th minute after Yokohama defender Shinnnosuke Hatanaka lost the ball just outside his own penalty area, but neither the former Corinthians star nor former Japan international Aria Jasuru Hasegawa could figure out a way to get the ball past the Korean goalkeeper. “I wanted us to score. That’s all I can say,” Kazama said at the outset of his news conference, drawing laughs as he reflected the frustration Grampus fans must have felt at the final whistle. The result saw Nagoya remain in third place, while Yokohama tentatively leapfrogged Oita Trinita into fourth ahead of Sunday’s slate of seven fixtures. Earlier in the day at Yanmar Stadium Nagai, a late goal by Ryosuke Shindo gave Consadole Sapporo a 1-0 win against Cerezo Osaka, putting a halt to the visitor’s three-game losing streak.